WIll there be a Definitive Edition Version? 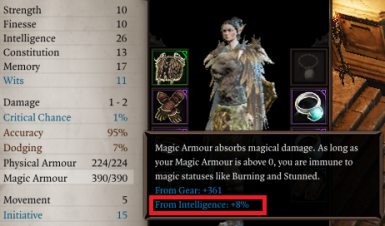 God bless you for making magical resistance reducing effects hit through armor. It balances magic so f***ing much. Can you make a version with just the atributes rebalance, Pls? Your changes to the primary attributes are a welcome addition to the game mechanics - well done and thank you very much! Not liking the min-max approach, i really enjoy this, as it opens up the game for more spread out builds without being too much of an overkill. that change major or minor values ... Hoping you see my point, but again thank you for this great mod! agreed. It would be nice to know what changes this mod does. As I said in the description, I have failed to document all the changes I've made because it's too much. I will try to make a decent documentation on it when I get back to it, but I will need a break from all these modding business I've done over the last month. Hi, so far, I like this mod a lot, I just noticed something strange. My Fane (not my avatar, classed ad a fighter) has a skill Void glide and skill Void Howl. If I make a new game, where he is my avatar, I do not get those skills. Do they come form your mod? And one more, the Void Howl does not seem to work as it cannot target any character. The caster is outlined, but cannot be selected as target. Is that intended behaviour? I'm really looking forward to mods like your's, which rebalance the game. Having finished my first playthrough of the game as 2LW on Tactician(the scaling got quite out of hand) im going to start playing honor mode now. I'm looking for mods which rebalance the game, making it considerably harder, with a more consistent or even increasing difficulty curve. I like to organize my mods all at once to have a stable and synergizing modsetup before committing to it, so it would be awesome to know which exact changes were made beforehand so i can decide if it would fit the theme of my playthrough or not. A detailed Mod description or readme with changes would be appreciated for that.